Roman Trokhymuk is one of the leading soloists of Lviv National Opera & Ballet Theatre of S.Krushelnytska. Known for his dominant stage presence and sympathetic acting, he electrifies audiences with his powerful, clear tenor voice and the warmth and passion of his performance. Roman is a graduate of the Lviv National Music Academy named after M. Lysenko, (Lviv, Ukraine), and studied under professor V. Ihnatenko. As a student he won 1st Prize in the regional competition of S. Lyudkevych. In 2003 he took a Master class at the Dresden Conservatoire in the class of professor Christian Elsner and the same year was awarded the Wagner scholarship. In 2009 he became a winner of the Grand Prix award of The Solomia Krushelnytska International Opera Singers Competition. He was invited to perform as solo tenor in K. Orf “Carmina Burana” in the Congress Hall in Zurich, Switzerland. 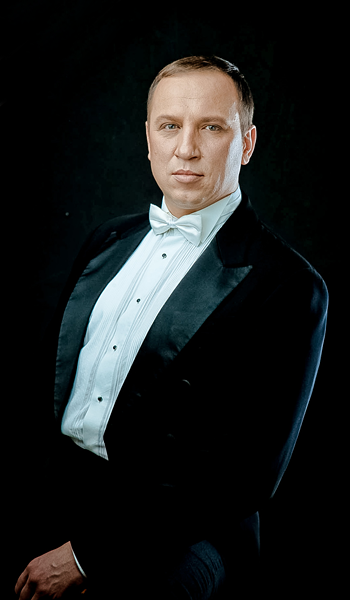 Roman has performed on all the major opera stages of Ukraine and has tour engagement with Kyiv National Opera Theatre. He has taken part in numerous concerts for state occasions and performed on more than 500 stages in Europe and Asia. March 27, 2015 according to the order of the President of Ukraine №180/2015 Roman Trokhymuk was awarded by the honorary title “Honored Artist of Ukraine”.